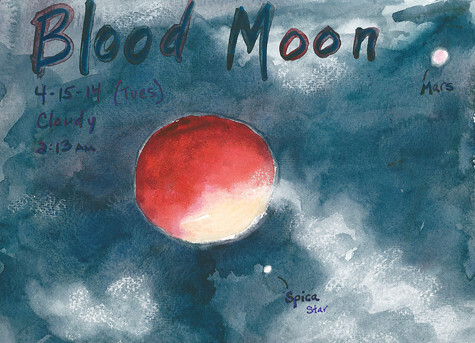 Blood Moon Sketch April 2014 – Let's Paint Nature! Last night was the spectacular Blood Moon. This is the first of four total lunar eclipses in a row, which is called a tetrad. Why does the moon appear red? The moon is reflecting the glow from the sun which is radiating on the other side and outer edges of earth. Position: Moon – Earth – Sun. Last night I set my alarm for 2am, not really expecting to see anything because of cloud cover and snow fall from last night, I let out a squeal, when to my surprise, out of my southern window, my eyes locked with a partial red moon! Oh how happy I am for the blessings of nature and to be able to share them with you! You are so aware on so many different levels. Thanks for sharing your aura. Of course, here I’m referring to the qualities that even transcend the dictionary definition of “aura”: a field of subtle, luminous radiation surrounding a person. Not of myself, but the aura is most likely the Holy Spirit working through me. I give Him all glory. Well, no worries! You still have 3 more chances to see it in the coming months. Set that alarm!! Thanks for the comment, hope all is well.